What are they? A firewall acts as a protective barrier between your computer and the Internet, monitoring all incoming and/or outgoing traffic and allowing only the network traffic you permit. Firewalls come in the form of software that nestles itself between your operating system and your network card. They also come in the form of hardware; for many home and small office users, it is a simple router device that sits between the network jack on your computer and the network wall connection. You can customize the level of protection the firewall gives you, setting it to filter information flow from specific domain names, addresses or types of network traffic. What risks are involved if I don't have a firewall? If your computer, like most, is automatically set to enable file sharing or to keep network ports open while you are online, you could be susceptible to a variety of attacks. If you don't have a firewall, which will monitor ports to stop unwanted traffic from slipping through, you have to know how to manually close ports and disable file sharing, in order to control risky traffic from coming in to your computer. What are some of the disadvantages of installing a firewall? If you use a firewall, you have to decide which kinds of network traffic to permit through the firewall. It is not always easy to determine which kinds of traffic are safe or unsafe. 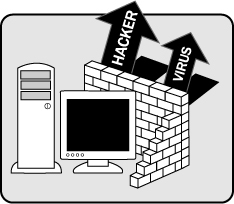 Also, like any add-on to your computer, a firewall can interfere with other applications on your system, making it difficult for the average user to troubleshoot any problems that arise. Firewalls are not failsafe, either. They may let malicious programs (disguised as friendly ones) slip through. Firewalls may also prevent campus vulnerability scanners from alerting you of a problem on your computer. Lastly, there may be restrictions on the use of personal hardware firewalls /routers, depending on which department or network you belong to on campus. If your computer comes with basic firewall capability or if you are thinking of installing a firewall, you should contact your tech support person first. UC Davis is currently exploring ways to provide campus departments with an economical firewall solution. To find updates on the progress of this project, visit technews.ucdavis.edu or security.ucdavis.edu. If you are a departmental LAN administrator, you can find a list of benefits and caveats as well as installation tips and considerations at security.ucdavis.edu/fwresource.cfm.